Heat pump hot water systems are a form of solar hot water system. They are often explained as refrigerators in reverse as they use vapour compression technology that extracts heat from the air. While a fridge expels heat into the room around it, heat pump water heaters absorb heat through a heat exchange process. Heat pump systems, in certain circumstances, can be approximately two to three times more efficient than a conventional electric hot water system. This results in higher energy efficiency and a considerable reduction of energy costs. 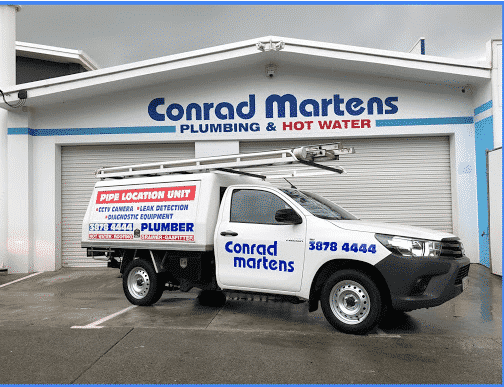 Here at Conrad Martens Plumbing and Hot Water we service a wide range of heat pump brands. The Rheem MPi325 and Stiebel Eltron WWK series, are two of the most reliable heat pumps on the Australian market. They offer fantastic energy savings when compared to standard electric water heaters. Quantum heat pump and Dux Aeroheat systems are also popular models we regularly service and repair. These systems offer great value for money and maintain high level of quality and low energy requirements. With the Australian government now offering renewable energy certificates through the renewable energy scheme, a heat pump hot water system is always going to be an attractive choice. However, it’s important to look at possible issues that may present themselves if you do choose to install a heat pump. Purchase price and install costs may be considerably higher in some situations when compared to standard electric storage hot water heaters. Some of these systems require lower water pressure which could create problems with showers, being hard to adjust temperatures or flow rate from the shower rose being to low. Maintenance and repair costs as the units get older could also be high as parts for these systems are generally more expensive. Not producing hot water? The first step is to check your electrical switchboard. Ensure the isolator for the hot water circuit is on and the fuse has not blown. Check your heat pump system is not on an off peak tariff as constant power may not be available to the unit. Heat Pump leaking water? Due to the way in which heat pumps operate, water may drip from valves and condensate drain lines while unit is on and heating water. The amount of water dripping from drain lines will vary based on climate and how much hot water you have used. If you find water dripping or running from drain lines while the system is not heating, or in standby mode, you may have a faulty pressure relief valve. To do a simple test for this lift the lever on the pressure relief valves for approximately 30 seconds. Allow water to run, cleaning any built up debris from valve. If the valve fails to shut off after the process is complete contact a licenced hot water specialist. Water should never leak from the heat pump hot systems storage tank. If you notice it is leaking it is likely the tank has ruptured and requires replacement. We recommend contacting a licenced hot water specialist to discuss and arrange the best solution for you.